Urethane Compression Molding – 50-Ton Molding Presses! Urethane Compression Molding ? You’ve come to the right source! Molded Polyurethane Wear Strips: Our compression molded polyurethane wear strips are cast and molded with ultra-tough materials and have proven to cut downtime, maintenance time and cost of parts. In our business, quality is critical. We’ve built a three-decade reputation for reliability, precision, and service, and our dedicated team of engineers has made Plan Tech an industry leader in the production of molded polyurethane wear strips. Molded Urethane Balls: Solid urethane balls can be used for check valves, light load ball bearings, relief valves, etc. Manufactured in several durometers and offered in different colors, according to customer’s specification. Our proprietary urethane formula allows our solid urethane balls to be one of the most durable available on the market. Urethane Compression Molded Cable Parts: Our urethane cable parts are designed for a good number of applications including industrial robotics, automated handling equipment, power generation, seaport cranes, machine tools, petrochemical and natural gas production, etc. Molded Urethane Stop Blocks: Compression molded urethane stop blocks and parts are designed by our engineers from our in-house machine shop from an AutoCAD. We apply different molding design operations utilizing compression molding and rotational force for the manufacture of our molded polyurethane parts. Molded Urethane Classifier Shoes: Urethane Molded Classifier Shoes are found in bulk aggregate handling systems in extreme abrasion conditions. Bulk handling systems are typically constructed with a corkscrew roller that will process material forward or backward depending on the rotation of the custom cast urethane classifier shoes. 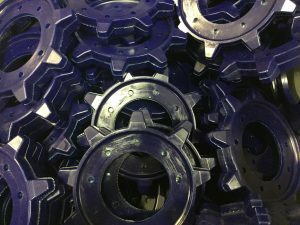 Urethane compression molding polyurethane parts in high volume allow us to produce hundreds of thousands of parts that are at a reduced cost vs machined urethane parts. When designing a new aluminum compression mold we will work with the end customer to understand how and where the part is functioning with questions such as where the parting line will meet. Our molds are CNC machined resulting in extremely minimal flashing with no mismatch where each has met. During urethane compression molding production, the mold will be heated and each half of the mold will be cast. 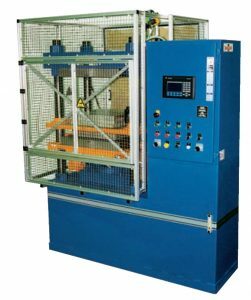 After a set time when the material has started to cure we will close the mold and place it in one of many heated 50-ton Wabash urethane compression molding presses that we have on site. Due to the design of the mold and the pressure, this will push out any air bubbles that may have been trapped during the closing of the mold. As the heat penetrates the mold the polyurethane will cure as one piece. This creates a part that will never delaminate as it is chemically bound to each half during the curing process. Any type of durometer hardness urethane material or special additives may be added to custom compression molded polyurethane parts. Urethane compression molding is ideal for applications with tight tolerances and where the cost of injection molding is an issue. With over 30+ years of experience, we have the expertise to create extremely intricate or small parts using urethane compression molding. Please Contact us for further details regarding urethane compression molding!